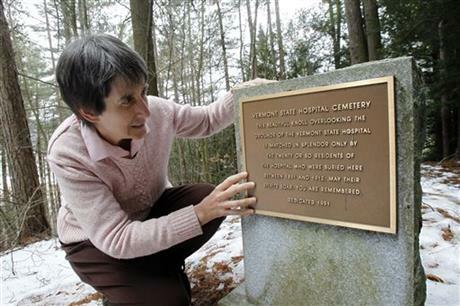 by Wilson Ring WATERBURY, Vt. (AP April 1, 2013) — An all-but-forgotten cemetery and its dozens of long-dead patients of the forerunner of the Vermont State Hospital are reaching from beyond their hillside graves to help modernize state law regulating what happens when someone dies and no one claims the remains. The issue emerged from the shadows of history because of Tropical Storm Irene, which more than a year ago inundated the hospital complex, destroyed many old patient records and rendered the complex unusable. As plans were made for a new hospital, some feared the cemetery was in danger of being forgotten again. "Somehow it felt incredibly important to give those people back the dignity of their identity," said state Rep. Anne Donahue, a Republican from Northfield and longtime advocate for the mentally ill. "I wanted to find out who was here." The patients in the Waterbury cemetery came from points all over the state, from Holland on the Canadian border to Bennington, in southern Vermont. One was born in Prussia, most of which is now Poland. Another was from Ireland. The youngest was a child who died at birth along with his mother. The oldest was 82. Their demises resulted from a variety of causes, but many list variations of insanity as an underlying condition; in one case, it was brought on by "domestic affliction." What they all had in common was dying between 1891 and 1913 while in state custody as patients at the Vermont State Asylum for the Insane. At the time they were buried, the cemetery, up a steep hill just above the Winooski River, looked out over a farm field now covered by Interstate 89. "They were all individuals who had no one willing to claim their bodies, and so they ended up here," Donahue said. Many of the original records of their lives — and deaths — were lost when Irene's floods inundated the nearby hospital complex. The state hospital itself was moved from Waterbury, and its permanent replacement is under construction in the town of Berlin. Donahue said she first heard of the hillside cemetery last fall during a ceremony marking the permanent closure of the last remnant of the hospital, abandoned during the August 2011 storm with the remaining patients spread across the state while officials figured out how to replace it. Over the decades, people have acknowledged the presence of the cemetery. A historian who wrote about the state hospital noted that in the 1970s, the indentations of the original graves were still visible. And it was marked in 1991 with a granite headstone remembering the people buried there: "May their spirits soar. You are remembered." Donahue spent months going through death and census records, as well as leftover information about the cemetery and the people buried there. Her list isn't definitive, but it offers a glimpse into a time when people with mental illness were hidden away. Sally Town was 30 when she died in childbirth along with her baby. Her pregnancy had been discovered two weeks before her death. Her death certificate said she died after her brain was destroyed by syphilis. Amelia Platka died at age 63 in 1898. The native of Germany died of liver disease. The cause of her insanity was listed as "domestic affliction." After hearing their stories and others, Donahue wanted to use her position as a lawmaker to pass a law guaranteeing the cemetery would be taken care of forever. But in researching the case, she found that that site, on state land, was already protected. Instead, she was shocked to learn the reason why no more people were buried at the cemetery after about 1912: State law began allowing the bodies of people who died unclaimed to be used for medical research, a practice that eventually fell into disuse. After she started working on a bill to repeal that law, she heard from Vermont's health commissioner, Dr. Harry Chen. He told her the state had no clear mechanism for the ultimate disposal of unclaimed remains. Right now, there is one body being held by the medical examiner that has no next of kin. A couple of others, in which the next of kin wants nothing to do with the ultimate disposition, are being held, Chen said. "At any given time, there are a couple corpses that are kind of waiting for people to claim them or figure out how to dispose of the remains in a respectful way," Chen said. "It's sad." The Vermont Medical Examiner checked with other states and determined that the procedures for dealing with unclaimed remains varies widely across the country, Health Department spokesman Robert Stirewalt said. Donahue's proposal outlines how unclaimed remains should be cremated and then held by the medical examiner's office for three years while a search is conducted for someone willing to keep them. After that, they could be buried or disposed of through other methods. The bill has passed the House and is awaiting action in the Senate. This entry was posted in Patient Burials. Bookmark the permalink. Post a comment or leave a trackback: Trackback URL.